Pam McConnell’s office has sent along two encouraging reports. First, construction work on Parliament between Wellesley and Bloor is progressing rapidly. The project is now scheduled for completion by the end of the workday on Monday June 5. This has been achieved by tripling the number of work crews on the job. It’s also been achieved by dedicating an overnight shift on Friday June 2 - the crews will be paving the street. The street will be completely closed from 7 pm on Friday to 2 pm on Saturday. Otherwise, the street will be reduced to one lane in each direction until the job is complete. 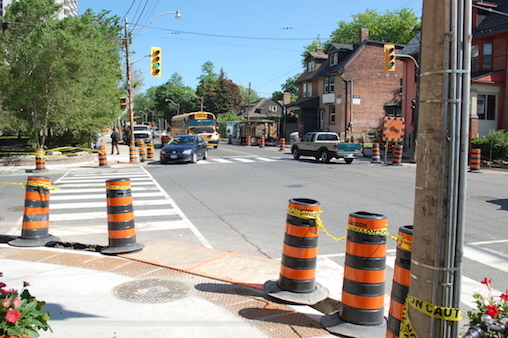 Second, the big closure at Dundas and Parliament is finishing early. One lane in all directions of the intersection is now open with overhead electrical work still to be completed. The final completion is expected by June 5. Congrats to the Cabbagetown Preservation Association for its successful annual meeting on Monday May 29. 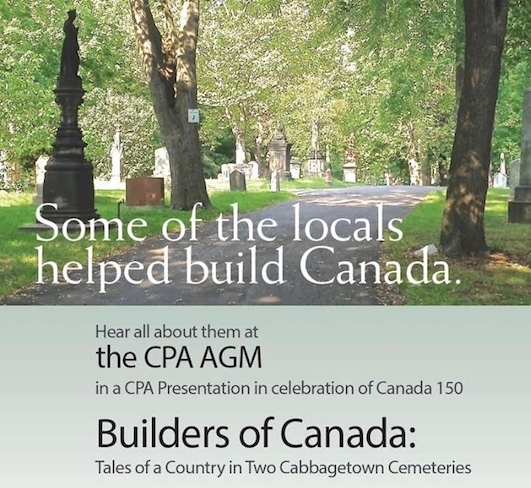 Gilles Huot and Virginia van Vliet talked about the “Builders of Canada”, the remarkable people buried in Cabbagetown’s two cemeteries. Starting with Joseph Burr Tyrrell, they covered the lives and contributions of Paul Kane, the Jarvis family, Justice John Beverley Robinson, William Lyon MacKenzie, Robert Baldwin, Samuel Lount, Peter Matthews, Thornton and Lucy Blackburn, William Gooderham, the Irish immigrants, Enoch Turner and the Gzowski family. There’s so much material that they decided to split their presentation into two and to talk about later figures in a second presentation. 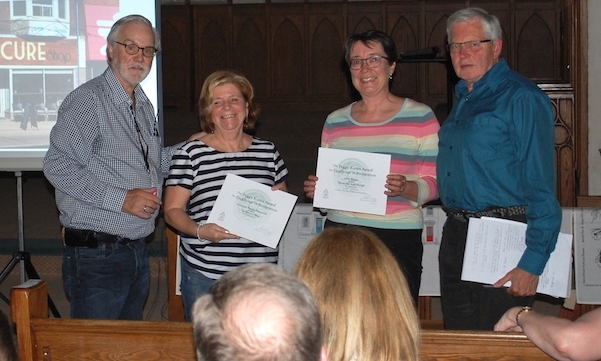 The CPA’s annual Peggy Kurtin Award for excellence in a residential restoration was given to Valerie and Andrew Pringle for their work on their home at 397 Carlton. Monica Kuhn was the architect on the project and represented the family at the meeting. A second award for an outstanding commercial renovation was given to Patty Junior from The Epicure Shop (473 Parliament). 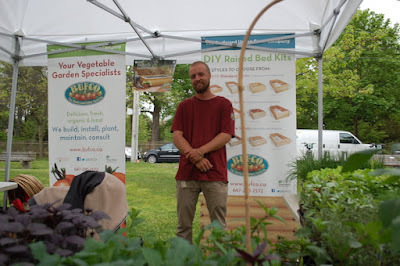 The Backyard Urban Farm Company is a new vendor at the Market. It’ll be there for the next couple of weeks. The company sells seedlings for your garden and also specializes in making raised garden beds. You can see samples of its work on its Facebook page and read about its full range of landscaping work on its website. Drop by the booth to get some plants that’ll give your own garden a head start and find out how you can design special features for your backyard. 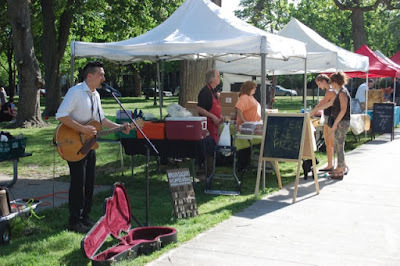 The Cabbagetown Farmer’s Market happens every Tuesday afternoon from 3 to 7 pm throughout the summer to October. It’s in Riverdale Park at the corner of Winchester and Sumach. 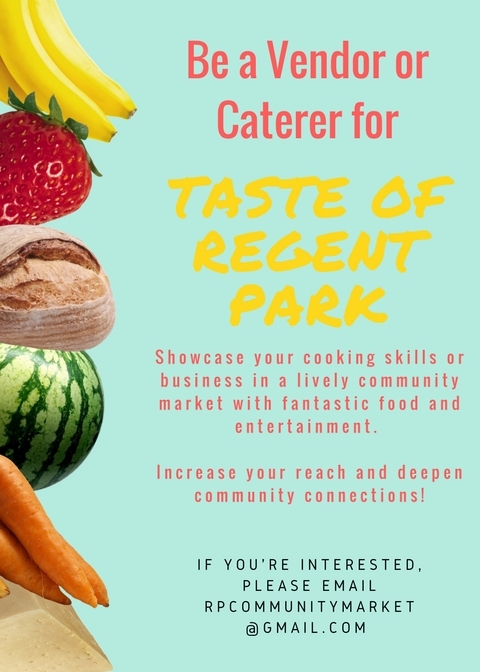 The Taste of Regent Park offers a combination of a farmer’s market, local vendors, a by-donation community meal, entertainment and kids activities. During July and August, it’s usually followed by an outdoor movie screening by the Regent park Film Festival. It all happens in the Big Park in Regent Park on Wednesdays from June 28 to August 30 from 5 to 8 pm. 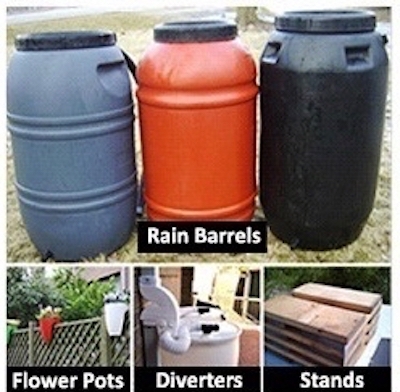 Cabbagetown South is selling rain barrels ($55 each) and several accessories. 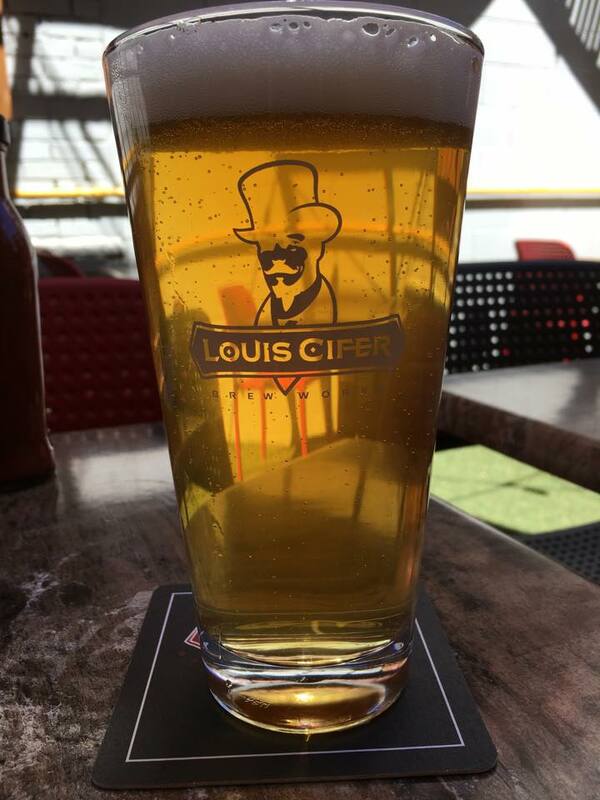 The barrels are available in the regular size and in three colours. It’s a fundraiser to assist the Association with its community projects. The final day for orders is Monday June 5. 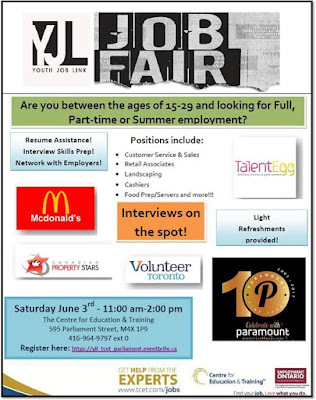 Pick-ups locally on June 10 from 10 am to 1 pm at 380 Ontario . For more info and ordering, click here. 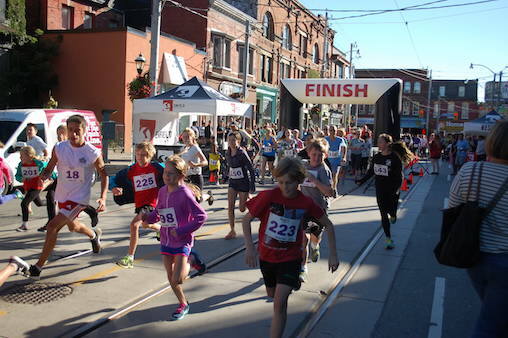 The Cabbagetown Youth Centre’s annual mini-marathon will again be staged during the 2017 Cabbagetown Festival. It’s scheduled for Sunday morning, September 10. Volunteers are needed. You can help in advance by joining your local street team. Each street in the neighbourhood is organized so that residents learn about the CYC, get a chance to make a donation and find out how to register for the Run. Volunteers will distribute pamphlets, contact potential donors and keep track of local donations and tax receipts. History under foot. Now that our streets and sidewalks are clear of winter hazards, we can look down for reasons other than preventing nasty falls. Near Pet Value on Carlton Street, you can see a 1934 “man hole cover” still doing its job after 83 years. Fortunately, City photographer (and one time Cabbagetowner) Arthur Goss documented City construction sites. This Goss photo shows that, apart from awnings, Carlton and Parliament hasn’t changed much. If you look closely, you can see a bicycle in the distance and the shadow of Goss’s head in the lower left corner. For more Cabbagetown history, photos and videos visit the CRPM Facebook page. Please support the Museum by clicking on GoFundMe. Eden Higgins is back at the Cabbagetown Youth Centre (2 Lancaster) and is teaching her recreational dance classes on Tuesdays and Thursdays. 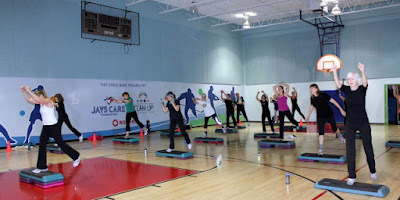 She’s offering three classes for kids - from 6 to 6:30 pm (for kids 6 to 8 years), from 6:30 to 7 pm (9 to 11 years) and from 7 to 8 pm (12 to 14 years). Classes are free. Drop in and register before the class. The Cabbagetown Youth Centre (2 Lancaster) has the perfect day camp for children and youth aged 4 - 18 years. The program includes sports, performing arts, evening leagues and more. Registration is now open. You won't want to miss it! Drop in to the CYC or go online here to register. 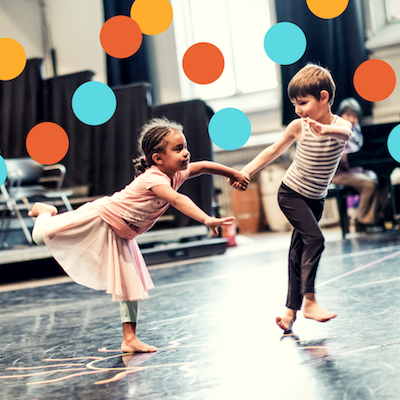 The School of Toronto Dance Theatre (80 Winchester) offers a week-long Summer Dance Camp for kids ages 5 and up right in the heart of Cabbagetown. July 17 to 21. Sign up your kids for a week of movement, creation, and fun. 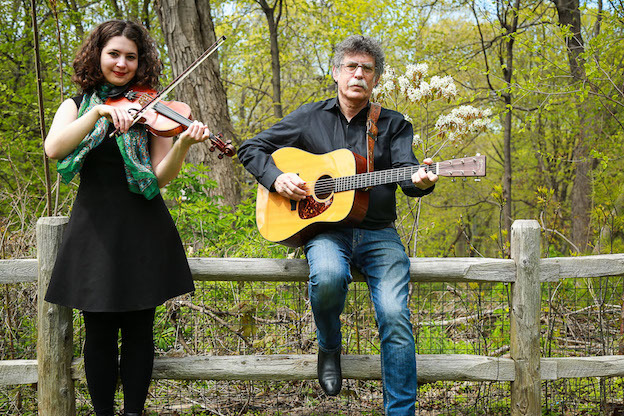 Classes are set to vibrant live music from some of the city’s most gifted accompanists. The schedule is jam-packed with dance and music, arts and crafts, and outdoor activities, all fostering self-expression and collaboration.Young artists will create their own dances, characters, instruments, sets, and costumes while learning the fundamentals of contemporary dance in a fun and safe environment. The week will culminate in a showing for the dancers’ families in the historic Winchester Street Theatre. There’s more information online. 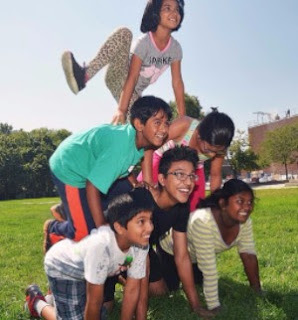 Send a kid to camp with the Neighbourhood Group. The group serves many high needs areas like Moss Park and St James Town. Your $75 donation will support a kid for one week. $150 pays for two weeks and $600 covers a full summer program. Click here to learn more and to make your gift. Toronto author Nathalie Prezeau will lead a walk through Cabbagetown lanes and streets to see our murals, public art and graffiti. 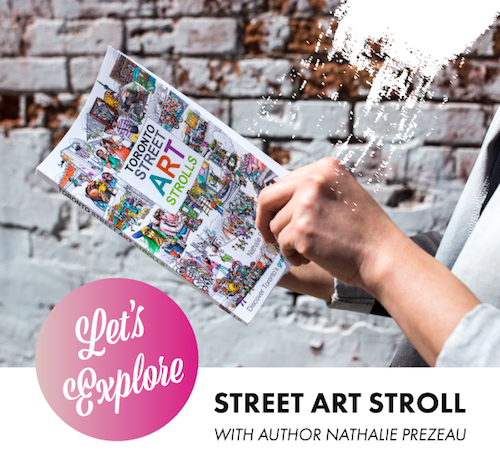 She’s written the newly published “Toronto Street Art Strolls”. Start the walk at Labour of Love (223 Carlton). Saturday June 3, 11 am to 1 pm, rain or shine. Free. The Centre for Education & Training (599 Parliament) is hosting a youth job fair for people between 15 and 29 years old on Saturday June 3 from 11 am to 2 pm. There’ll be assistance with resume writing and interview skills. Interviews on-the-spot with employers including Tim Horton’s, Mcdonalds and Canadian Property Stars. Positions are open in retailing, customer service and sales, landscaping, food service and more. Click here to register. 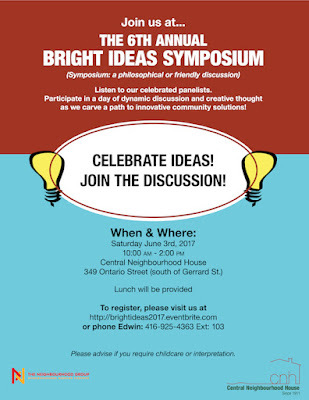 Save the date - the Neighbourhood Group will host its sixth annual Ideas Symposium on Saturday June 3, 10 am to 2 pm at Central Neighbourhood House (349 Ontario). There’ll be celebrated panelists and lots of discussion. Lunch is provided. It’s free - everyone welcome. To register, call Edwin at (416) 925-4363, ext 103 or go online. The Association is holding its next meeting at Hey Lucy (229 Carlton) on Wednesday June 7 at 7 pm. A representative from a security company will talk about home security, cameras and security systems. There’ll also be a discussion about two development proposals, one at the Gerrard Street Beer Store and the other at Sherbourne and Gerrard. The Cabbagetown BIA together with Cycle Solutions (444 Parliament) is organizing a bike workshop on Saturday June 11 from noon to 2 pm. Bring your bike for a simple checkup. Enjoy some munchies from Charro Mexican Restaurant (582 Parliament). Green Thumbs and Cycle Toronto Ward 28 will offer kids activities. It all takes place on the corner of Carlton and Parliament. 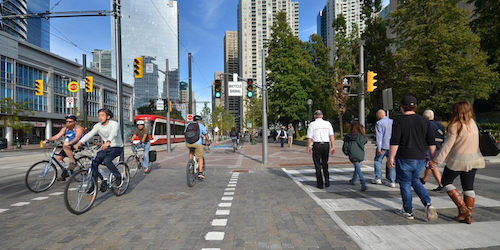 June 8 and June 13 at 7 pm - there’s a 90-minute tour of the Queens Quay revitalization. The starting point is the Simcoe WaveDeck (lower Simcoe and Queens Quay). 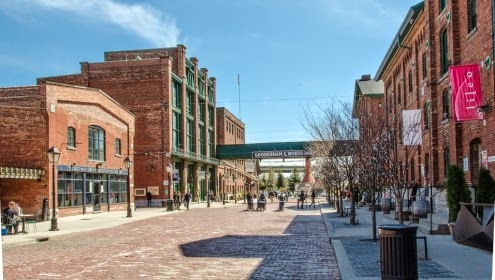 Saturday June 10 at 11 am - take a 75-minute walk through Corktown Commons. Meet at the Pavillion on the hilltop. Thursday June 15 at 7 pm - visit the public art in the West Don Lands. Start at Underpass Park. Saturday June 17 at 11 am - walk through the central waterfront to explore its history. Start at 60 Harbour Street. 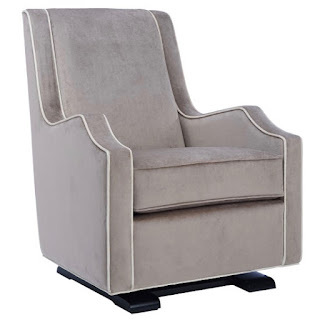 Kendall & Co (514 Parliament) has a brand new line of upholstered furniture that includes gliders, recliners and swivels! Visit the shop and have a seat on the floor models. Made in Toronto, with the fabric of your choice, priced at great value. Now featuring select styles in sofas and armchairs. The Décor Associates can take you through the collections for your living room, dining room and bedroom. Visit Kendall’s website for a preview. Kendall & Co is your one-stop-shop for furnishings, lighting and decorating - open from 10 am to 5 pm on weekdays and 11 am to 4 pm on Saturdays. 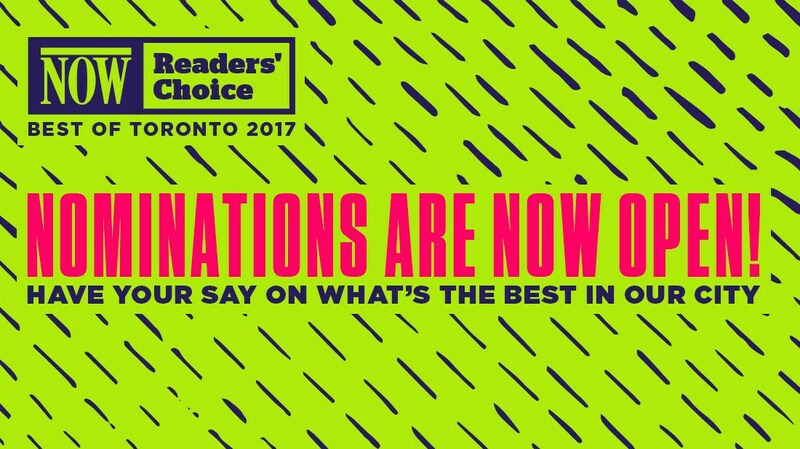 awards bring city-wide attention to the businesses that are selected - either as a winner or runner-up. 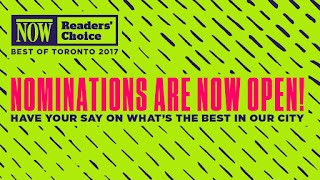 Go to NOW’s website and nominate your choices in each category. 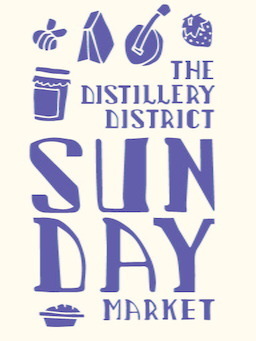 The Sunday Market has returned to the Distillery. It runs each week through the summer from noon to 5 pm. Outdoor vendors will sell food specialties and artisanal treats. Last week, Pam discussed the very serious impact of the flooding on Toronto Island. Thanks to Victoria Hadden for this info. There’s a video produced by CityNews online here. On Monday May 22, the Toronto Star wrote about three new development proposals affecting the Distillery. Jesse Winter’s story includes descriptions of each project along with residents’ and heritage reactions. City of Toronto officials are holding public consultations about rooming house regulations. 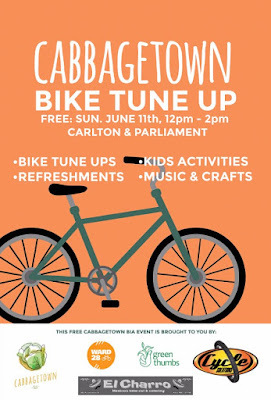 Cabbagetown’s session will be in Room A in the Wellesley Community Centre (495 Sherbourne) at 6:30 pm on Tuesday June 27. The online edition of The Bulletin has background details about this initiative. Regent Park’s young trees are dying. The City of Toronto has acknowledged the problem and is planning for soil remediation and tree replanting. The CBC reported this story - click here. Guitar maker Linda Manzer joined Tom Powers on CBC Radio’s program Q to talk about the McMichael Gallery’s show, The Group of Seven Guitar Makers. Click here to read the story and to find links to the broadcast. I wrote to Danny recently and asked what he’s been doing. Not much, he says. Then I checked his Facebook page. On Friday, he’s on the program at the annual Orangeville Blues & Jazz Festival. 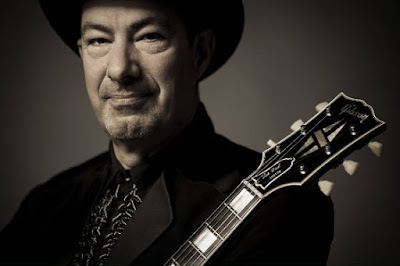 He’s playing regularly at the Cadillac Lounge (1296 Queen W) on Saturdays from noon to 3 pm. This weekend, he’s also appearing at the Bay City Music Hall (50 Leander Dr in Hamilton) in the Blues with a Feeling concert. Of course, he’s still doing his Bluz-FM radio show from 8 pm on Saturday nights on Jazz-FM 91.1. On Friday June 16, he’s back on stage at the Silver Dollar (486 Spadina) for its “Last Shuffle - before the wrecking ball swings”. You can keep up with his appearances on his Facebook page. By the way - hint - no mention yet about a show at the Cabbagetown Festival. A day of presentations, demonstrations, discussions and workshops about puppetry. The evening cabaret presents exciting innovations and new performances. 10 am to 10 pm, Saturday June 3, Aki Studio Theatre, Daniels Spectrum (585 Dundas E). Daytime conference $55, cabaret $25, package ticket $70. On Saturday June 3 from 2 to 6 pm, it’s Alana and Leigh Cline, the Ever-Lovin’ Jug band. Mangos are featured in Cyril’s next cooking class - Wednesday June 7, 5:30 pm, $45. He says that it’s one of his favourite foods. The menu includes a mango and cucumber gazpacho, a Thai green mango salad. a chicken-cashew-mango dish and a no-bake, no-crust mango cheesecake mousse. To register, call (647) 348-0411 or drop in to Merryberry (559 Parliament). Porgy & Bess - on stage June 1 to 3 and June 9.